The second edition of Kargil International Film Festival (Kargil IFF) came to an end at an event held at Syed Mehdi memorial auditorium Kargil on 23rd August, 2017. Kacho Ahmed Ali Khan (Chairman/Chief Executive Councilor LAHDC Kargil), Aga Syed Hassan Arman Musavi (Executive Councilor LAHDC Kargil), Mohammad Hussain (Executive Councilor LAHDC Kargil), Ishtiyaq Ahmed Kacho (Deputy Superintendent of police), Shabeer Hussain (Assistant Hq kargil) & Nasir Mehdi Shabani (assistant professor government degree college kargil) presided over the closing ceremony. 21 awards in four sections which included “Best feature film”, “Best short film”, “Best documentary film” & “Best animation film” both in International and National category were given away. Golden Ibex award was introduced this year to honor film makers who have done exceptionally well in their story telling with their limited resources and have experimented with the art of film-making in unique ways. Through this award, festival committees also hope to bring to notice of the public and authorities, the urgent need for conservation of endangered species Ibex. Kacho Ahmed Ali Khan (Chairman/Chief Executive Councilor LAHDC Kargil) in his speech accepted that he was only productive in managing the legal permission for the second edition of the film fest. However he has promised to ensure the third edition of Kargil IFF to be done in a more grand and organized manner. Mohammad Hussain (Executive Councilor LAHDC Kargil) also mentioned that, this kind of films is the need of the hour as it helps everyone to learn and understand many things which otherwise is lost in communication. Aga Syed Hassan Arman Musavi (Executive Councilor LAHDC Kargil) a religious leader mentioned on how to understand and use the positive aspect of what a film tries to convey instead of sticking to the negative elements showcased in it. Ishtiyaq Ahmed Kacho (Deputy Superintendent of police) felt this was a very good platform to learn cinema and he urged the youth to channelize this opportunity in productive learning and make films so the world could see the work of our region. 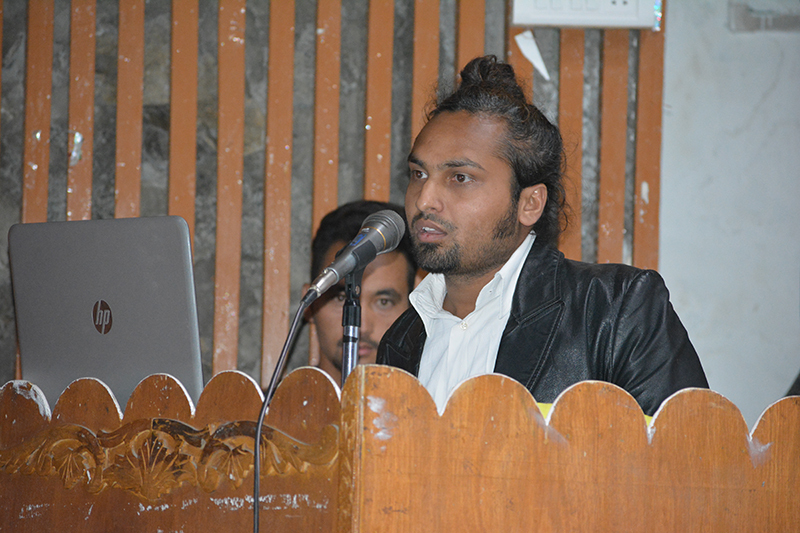 Festival director Mr. Meraj Siddiqui in his closing report announced July 2018 for the third edition of Kargil international film festival. He emphasized on more youth coming forward to organizing more cultural events and announced a special category in competition for Kashmiri filmmakers for the next edition of Kargil international film festival. In his closing statement he thanked each and every member especially LAHDC, SEMOK & festival coordinator Mr. Sajjad Hussain for organizing such a good event and he strongly believes it’s the youth of the region who will showcase Kargil’s rich and vibrant cultural heritage to the world. Kargil international film festival screened 85 films from 29 countries from 21st august until 23rd august 2017. DBG Film club also proposed a plan to the committee in which it requested to hold a 7 day film workshop for the enthusiast of the region which will give them hands on experience to know the fine nuances in the art of filmmaking. Certificates were distributed to volunteers and organizers. The event was attended by people of various private & government organizations & saw a huge attendance of students from government colleges and university. This Festival is organized by DBG Film Club in collaboration with Ladakh Autonomous Hill Development Council Kargil (LAHDC) & Students Educational Movement of Kargil (SEMOK).The event concluded with a vote of thanks by Zaheer Abbas. Please note: List of winners for the second edition of Kargil International Film Festival 2017 will be updated shortly. Addressing the media, Festival director Meraj Siddiqui mentioned how this film festival will unlock a lot of things in the region. Tomorrow will be the last day of the film festival. The announcement of the winners will happen post the closing film "Save". Due to public demand "Recoil" will be screened again.